July is always a great month and it's nice and hot in Washington state... I love summer I love heat.. I hope you're having a great summer, getting some beach time.. just traveling and enjoying summer. 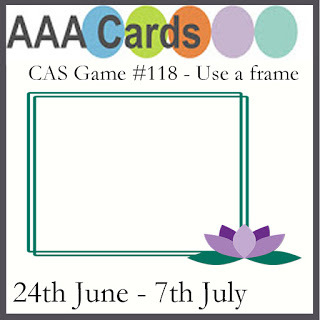 I hope you have time to play along with us at AHB. This stamp set is from Taylored Expressions.. It's an old stamp set. 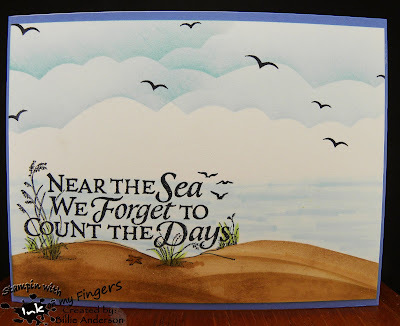 I stamped the images on scraps of Quick Quote dp. I fussy cut the images out and added some copics to give interest in some areas. 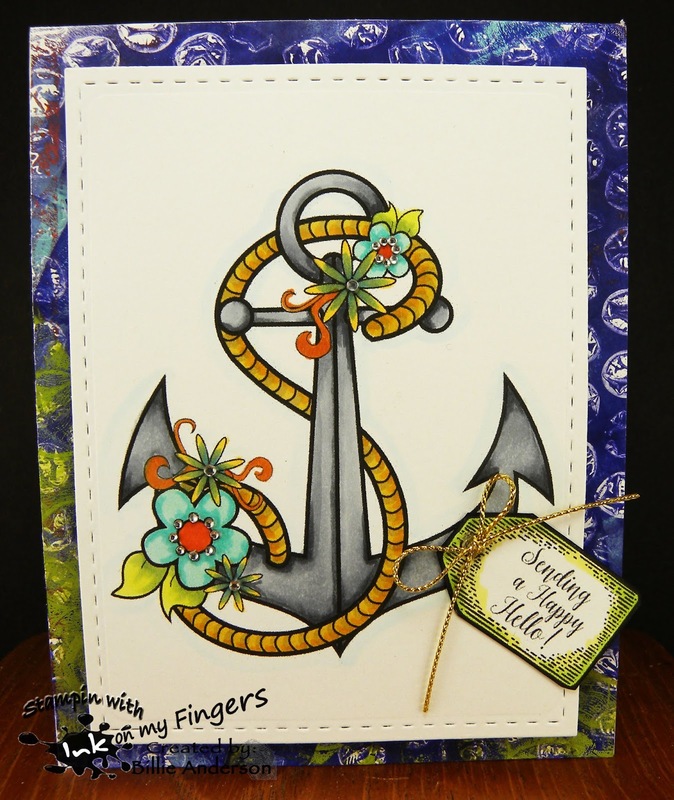 I stamped the sentiment and used a My favorite things stitch die. 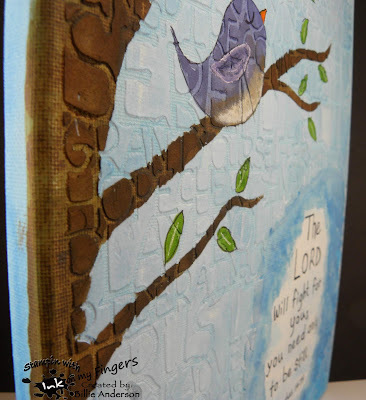 I used an embossing folder for the background then layered the images. I used a white gel pen to areas and Spectrum noir sparkle pen. I added the twine. Was a fun card to create. As you like it - fav. kind embossing (embossing folders. so many different types out there and give interest to a bg with out taking away from the image. 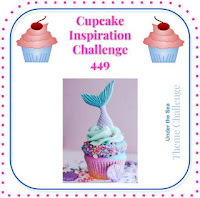 We have a great challenge for you on this last day of June.. 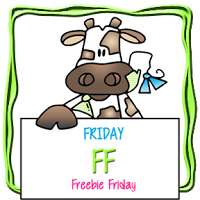 Welcome to another Free Friday at Bugaboo..
over at Catch the bug.. This image is called BEAR FLOWER.. I have used this before as a mothers day card. I am now using it as a thanks card.. This image can be used for different themes. 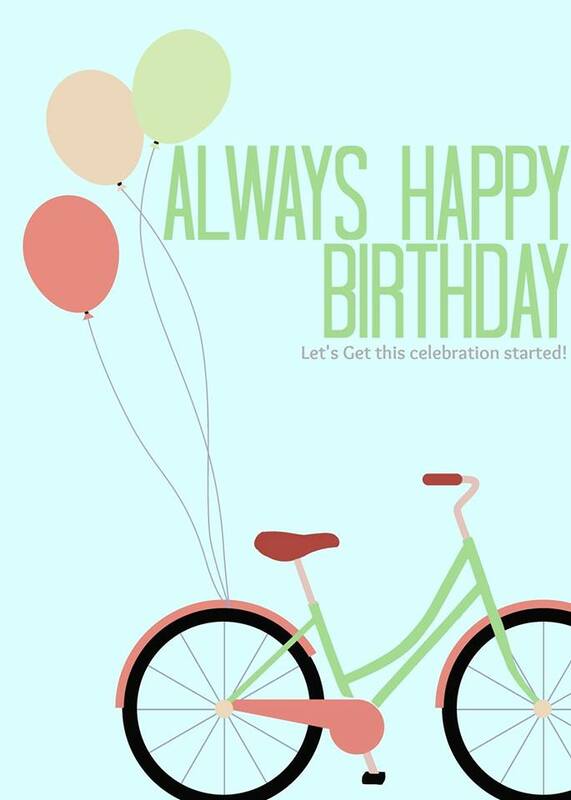 Would make a cute birthday card. I have a PTI background die and I used some X-ray film and die cut a piece to create a stencil. I then used a couple different Ranger inks to create the background. 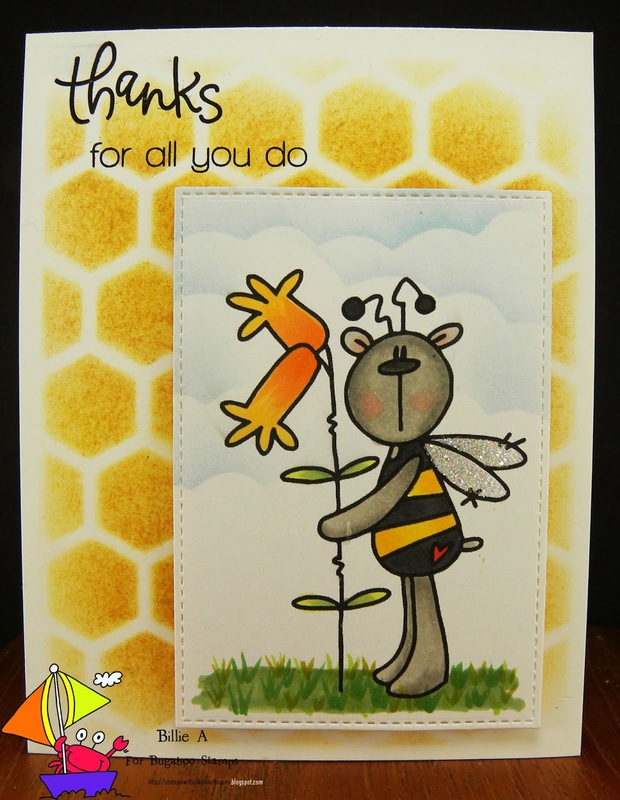 I die cut the image with My favorite things stitch die and colored the image with copics. I added some glitter to the wings. I used a Simon says sentiment. 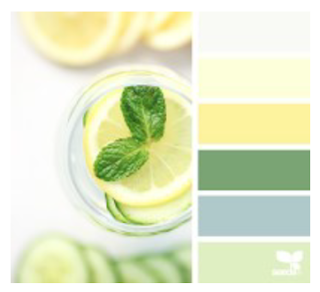 It's time for another challenge at Colour Crazy Challenge.. 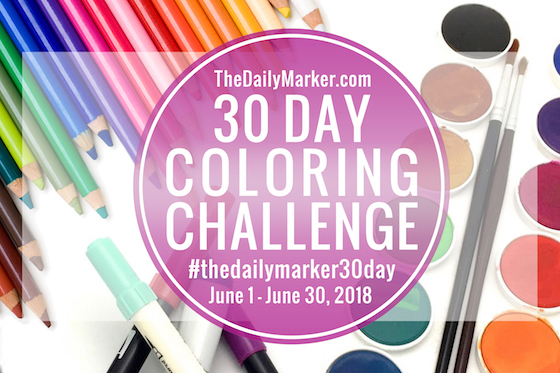 The challenge is always ANYTHING GOES.. just make sure it's a project that you've done some coloring on. No pre-colored images. 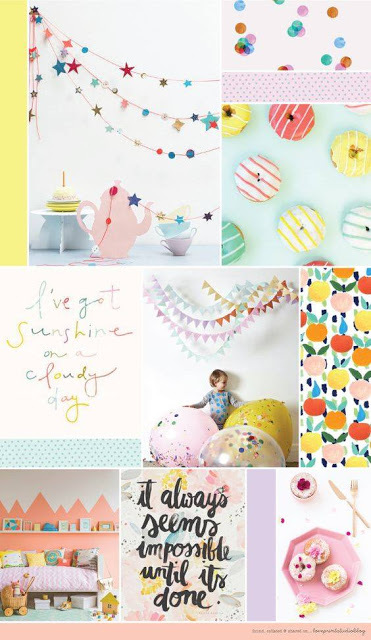 I am using the Bugaboo image called Baking Dottie.. I colored her with copics. I then used Simon Says wonky die to cut her out. 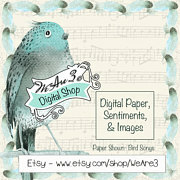 I added this image to the Amy Tangerine designer paper (which I love) and added My minds eye bakers twine. 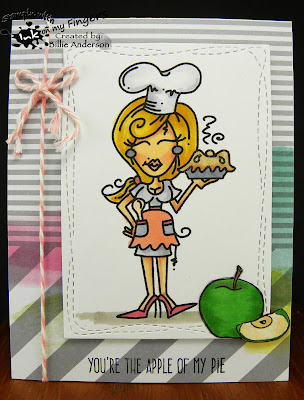 I stamped Simon says sentiment and stamped the apple and fussy cut this out. I added some Spectrum Noir sparkle pen to the apple slice and pie crust. 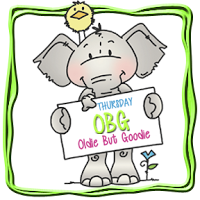 Thursday at Catch the bug is Oldie But Goode day.. It's a fun day to use an older Bugaboo image. 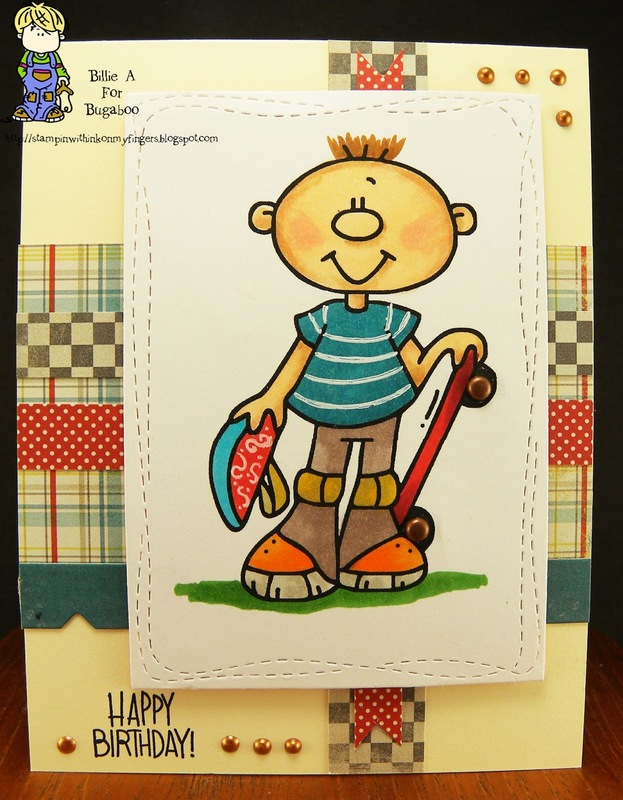 This cute image lil dude skate board image is always fun to use. I like the cute pose. I colored the image with copics. I used some brass brads inside the wheels on the skate board. I added some white gel pen to the image. I finally used Simon Says wonky die to cut the image out. I went through a bunch of scraps.. I think most are My minds eye and created a layered background. 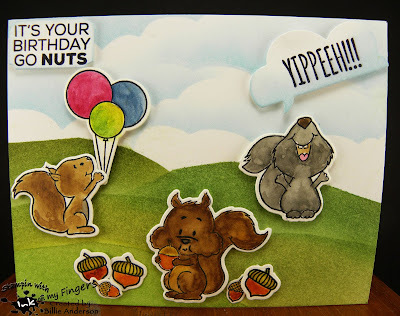 I did use a My favorite things die on the teal piece. I added Simon says sentiment. To finish off the card I added some bronze Nuvo drops to go with the brads I used on the skate board. fun boyish card. This challenge over at Sunny Day Crafting will run till July 14th. 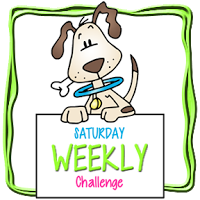 Starting July 15th we will be a monthly challenge and our challenges will be any ANY ANIMALS and you can enter up to 3 times.. I hope you will join us in this change. For my card I used Gerda Steiner squirrels and acorn and Tech. Tuesday sentiment and another acorn. The balloons are from My favorite things.. 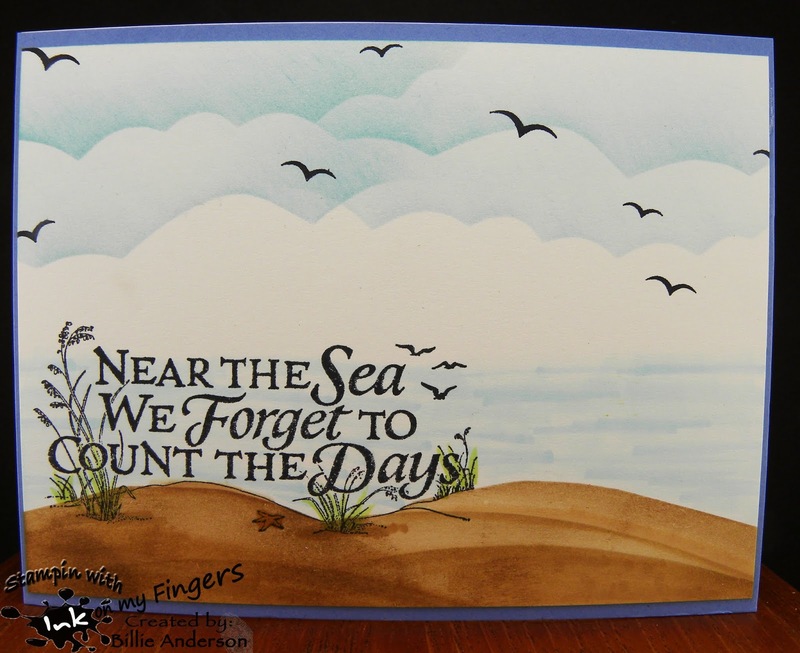 I started by laying out the images and then using Ranger inks create the ground and sky with my templates I created. 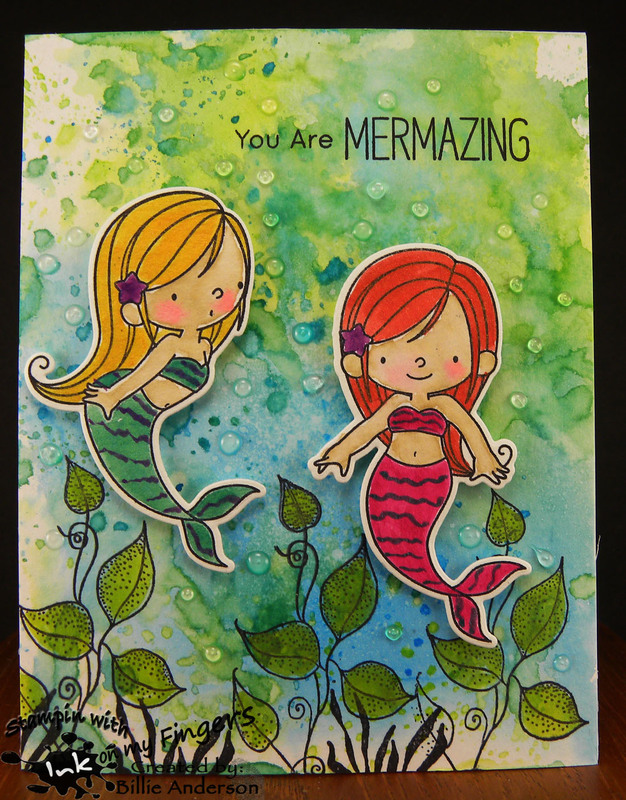 I then used Mission watercolors and painted in the images and cut them out with their dies. For the Yippeeh!! I used Simon says speech bubble. I then stamped the birthday sentiment and used Stampin up die. I then laid out the images. I went over the balloons with Spectrum Noir sparkle pen. A friend came over and I was showing her what can be done with Ranger inks and smooshing and this is the paper I created. Now I can use it for the water mermaid theme card. That worked out perfect. I took a few rubber wood block stamps one from Rubber seed and Magenta and stamped the foliage below. 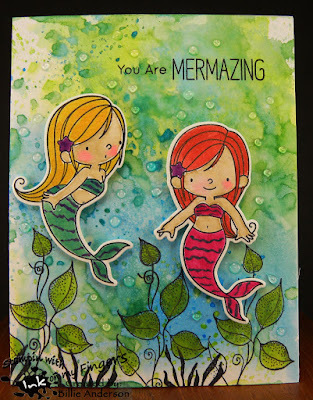 I then stamped some mermaids from My Favorite Things on water color paper and using H2O paints colored them in and the leaves. I used Zig marker for the skin and cheeks. 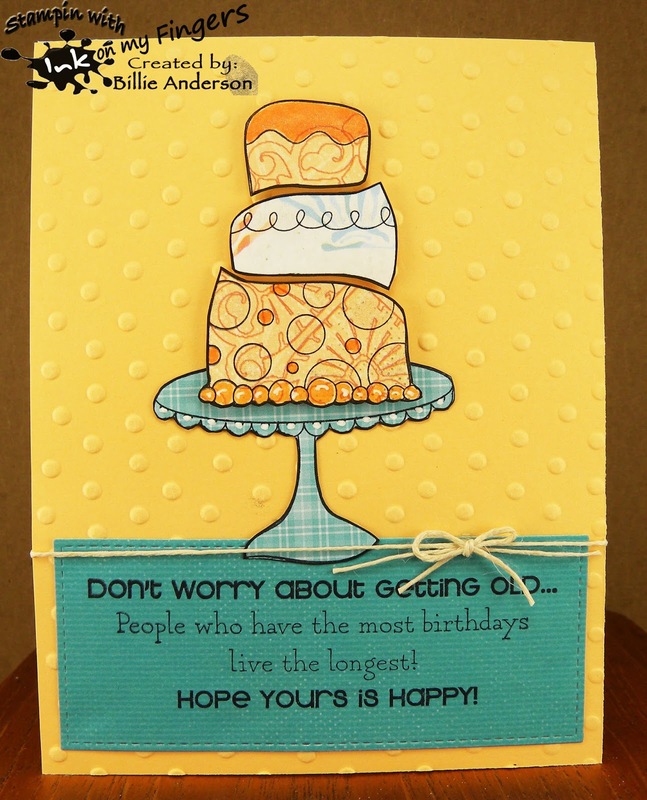 I die cut the images out and added the sentiment from MFT and the images. I completed the scene by adding some clear Nuvo drops so it looked like water bubbles. Cupcake inspirations #449 - photo insp. Hi .. Hope you're having a blessed day and ready for a new challenge at Craftaholics R Us #26.
lets see what you can create with this theme. 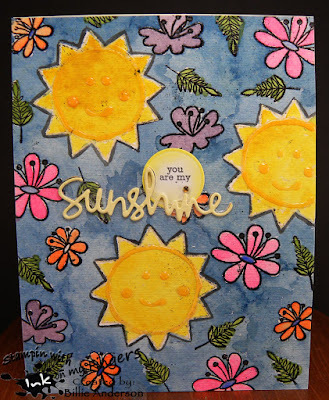 for my card I used water color paper and stamped the sunshine from Simon Says 3 times.. I heat embossed with a light yellow.. wrong.. don't do it.. I then heat embossed the My Favorite Things flowers and leaves in black.. that worked. I probably should of turned the paper over and started again.. but I didn't. I used Mission water color paints and colored the images. The sunshine images just didn't pop so I took a fine line paint brush and black paint and went around the sunshine images. There is a little face on the stamp and was very faint to see with the light embossing so I took Nuvo drops that kind that dries clear and added the circle and smiley face. 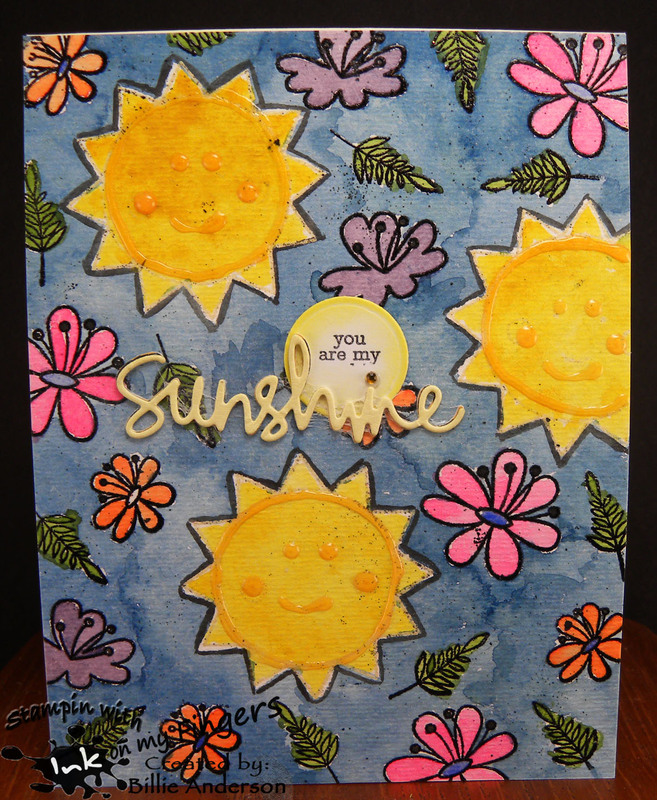 I then stamped the "you are my" and using My Favorite Things circle die cut it out. I went around the circle with Quick Quote ink. 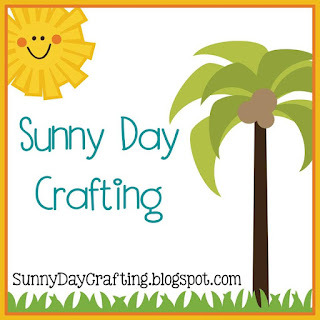 I then die cut the Sunshine by Simon Says and added it. I added a bling for the i dot. Next month we are taking a trip to visit my daughter.. She lives in another state about 9.5 hours away.. I wanted to paint her a canvas. 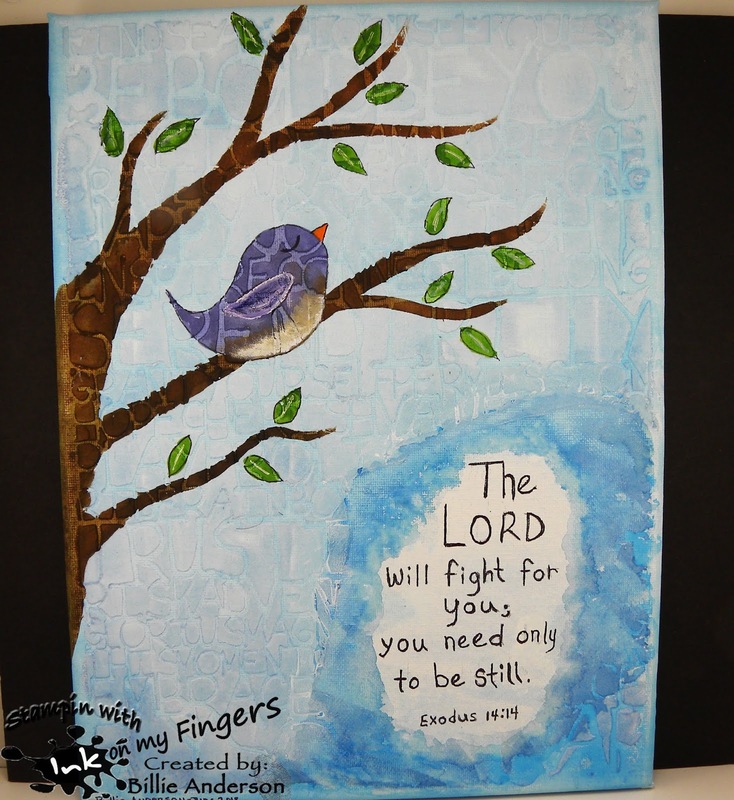 I went looking on Pinterest and found a painting I really like and it was a bird in the tree with this scripture.. I painted my canvas very much like what the photo showed. This is a side view so you can see the words and texture the background has. 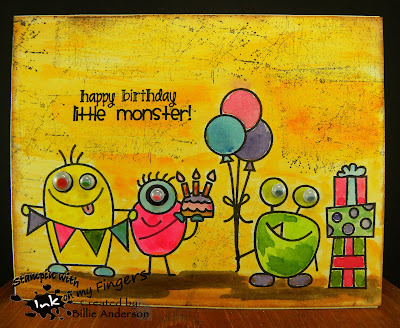 I stared by using my new stencil from My favorite things and Oxide ink in two yellow colors and created he background. 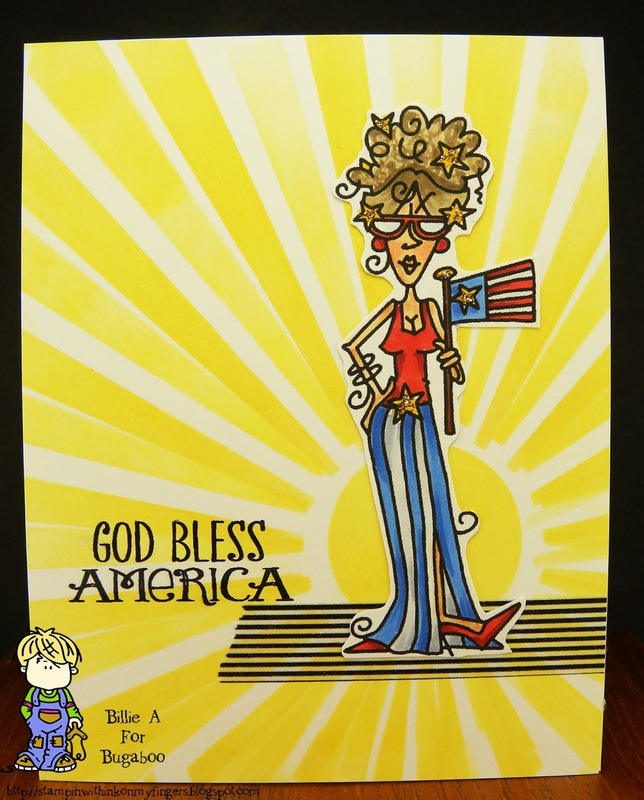 I then colored the image with copics and fussy cut her out. I added a piece of Washi tape for her to stand on and then stamped the Verve sentiment. I added some stickles to the star areas. I am such a water person.. I don't know if it's because I was born and raised in Washington state and on the west side where the water is.. (vs. eastern WA. where its dry, hot and only lakes) To me at this ripe old age fun at the beach is just to sit and watch the waves, seagulls, people, reflections and other sea life. It really warms my soul to see the water. We live about an hour to the sound and it's only because of the winding roads. If it was a straight shot it would be shorter. Well for my card I stamped the sentiment by Santa Rosa PSX.. I then used my ground and cloud template and Ranger ink. Then using copics I sketched in the water. The sentiment had a few seagulls included but I used Simon Says seagulls and added a few more to the sky. This is my happy place.. Welcome back to my blog. I hope your summer is going great and you're doing fun things. Getting some vacation time in. 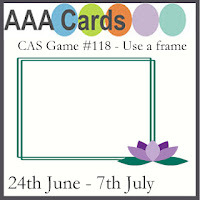 Today I am showing a card I made. I stamped the Taylored Expressions monster images and then using Mission water color colored in the images and background. The background needed something else so I went through my Club scrap background images and found this one that just gives a little hint of texture. I love the simple but effective look. I then added some Spectrum Noir sparkle pen to different areas. I added some fun google eyes to the monsters. This will make a little child or big child happy. 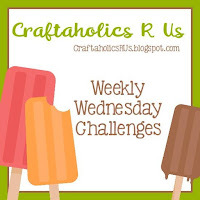 Welcome back to a fun challenge at Catch the bug.. This is my card. I found this piece of scrap yellow designer paper so I grabbed some Washi tape and added some to the side and under the sweet KIDZ TOY KITTY image to ground her. I then colored the cute image. I got a big burp of copic color dark C7 on the image.. It's under the sentiment. boy I am glad I didn't get the burp of color up on the kitty face. I love copics but every now and then I get a big burp of color. I guess I over fill. If you ever have that issues, take the caps off both ends and just let it be for awhile. It evens out the ends. I like that some of the colors are in the washi tape and rest are from coloring the image. I fussy cut her out. I forgot to say the sentiment is from My favorite things. It's time for another Free Friday image from Bugaboo.. You can see the design teams fun creations over at Catch the bug. This is the fun Free Friday image called BEACH DUCK.. 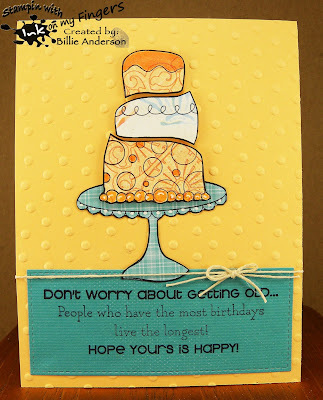 I used a My favorite things stitched die to cut the image out. Quite some time back I created a bunch of background papers by using Ranger Oxide inks on glossy card stock and smooshing. Once you let it dry you just buff the page and it turns out nice an glossy again. Well digging through my stash I found this piece which I thought worked great for water. So I adhered to the card base. I then used copics to color the image. I added Spectrum Noir around the sun area. I added glossy accents to the drink, water in the image and glasses. 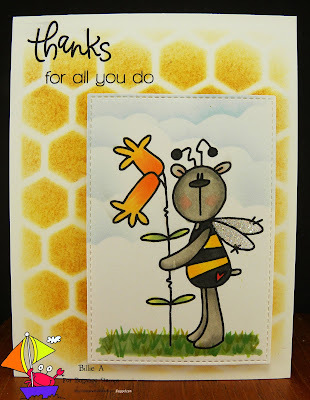 I used black Stazon ink to stamp the Simon says sentiment. This is my card. I chose a gelli plate piece I created years ago by using acrylic paints and bubble wrap. The image I chose from We are 3 is called "Seaside anchor". We also got some tags that we could use. I chose this one saying "sending a happy hello".. I colored the image with copics. I then added some gems to the flowers. I fussy cut the tag out and added Stampin up gold cording tied in a bow. I used Lil inker stitch die to cut the image out. I added this to the background paper on a piece of craft foam for some dimension. This is a very pretty image I love the feminine feel.